I've decided to take a break from tv, radio and Facebook. With everything happening, I just can't anymore. I've been thinking about that shooting in CT. I just feel so confused about it. There are so many questions, yet no real answers. My stomach has been in knots since I heard the news and I just can't wrap my head around it. There are so many people armchair quarterbacking about gun control, school safety , mental health treatment, etc. that I just can't handle. It also doesn't help that the media is sensationalizing everything to the point of saturating everything and confusing things even more. I'm taking a stand in my own mind. I will focus on those young people that lost their lives, as they are the real victims here. I can get on my soap box and talk about mental illness and the lack of knowledge about diagnosis and treatment, but it won't bring anyone back. I can rant about gun control, but what good would it to to those families that lost loved ones right before Christmas? I'll be glad when this year is over an look forward to a brighter 2013. 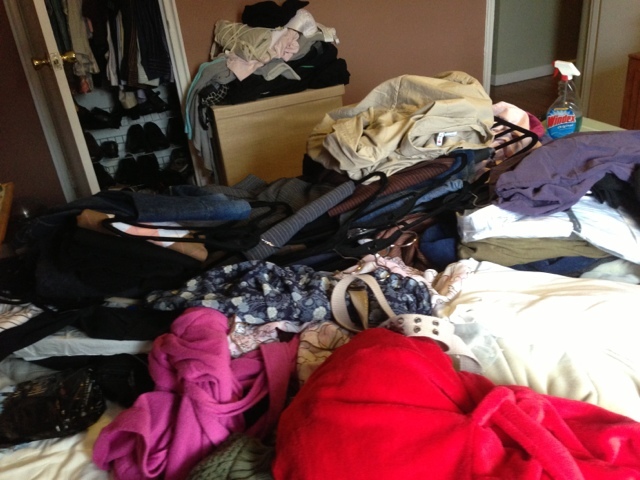 In acknowledgement of my new size and shape, I have been doing one of those irrational purging of my closet. 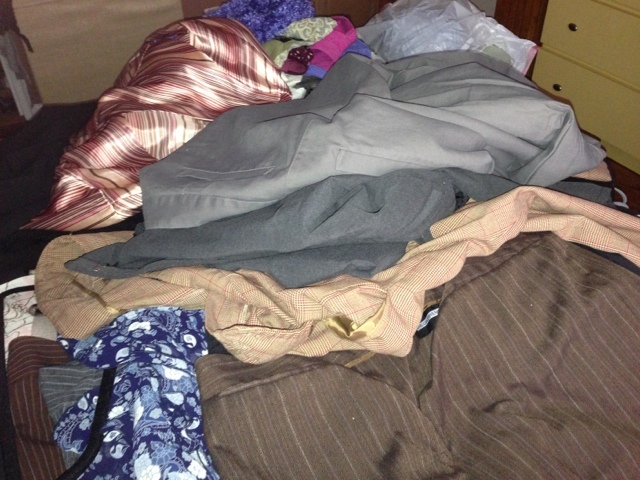 I've filled 4 large garbage bags with clothes and other crap that doesn't fit. Well, that stuff hasn't fit for a long time, I was just too lazy to get rid of everything. Like did I still need the t shirts I got in 2003 for participating in a charity walk? Especially since I never wear them at all, not to sleep in, gym in, or clean in. I donated all of my stuff to the victims of Sandy, so I was able to get my frustrations out and be charitable at the same time. Paying it forward. Here is just a sampling of what went.